EPISODE 2, SEASON 3- "THE PURPOSE OF THE MACHINE"
Last week, we saw that the United States government was reacting to the Inhumans popping up everywhere and how also S.H.I.E.L.D. is trying to build a team of Inhuman for their own peacekeeping purposes. This week, we took a break from that for three reasons. One, Fritz had to get Jemma back. Two, we had to know what May was up to. Three, we had to find out what Ward was up to. We focused on those three storylines tonight. 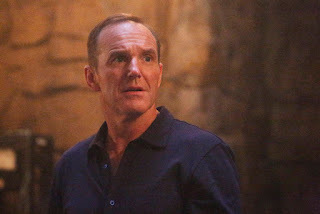 We know that the liquid rock in Coulson's custody put Jemma halfway across the universe, other than that we don't know much more. Nothing else was illuminated upon tonight, the main focus was bringing Jemma back to the team. Peter MacNicol returned as Elliot Randolf, the Asgardian the team encounted in season one to help rescue Jemma out of the portal she fell in and the team is successful. I sense we will learn more about Jemma's whereabouts next week, and I will be curious to see if we will learn anything more from it. We learn that Lance Hunter (Nick Blood) had a special task to go after Grant Ward, and Hunter is under specific instructions to kill Ward. Not capture him, not bring him to authorities, to kill him. Ward is off taking the fractured pieces of HYDRA and building it up again from the bottom. Hunter feels he'll need the help of May in order to bring Ward down, and he tracks her down and offers her to come back to the team. May went "on vacation" and never returned, moving to the somber life and taking care of her father. May turns Hunter down initially, but push from her father tells her to go assist Hunter. I love the idea of May and Hunter pairing together on the show, because they are both badasses. I am looking forward to some memorable scenes of them together. So Ward is building HYDRA back up, and his first action is kidnapping a rich, snobby kid. At least, rich and snobby is what I thought at first. The kid turns out to be none other than the son of Baron Wolfgang von Strucker, the guy Ultron killed in Avenger 2. Spencer Treat Clark, who may remember from movies like "Gladiator," "Unbreakable," and "Mystic River" plays the son of Strucker, and we an automatically see he has a deranged side, much like his father. Clark is great at playing these damaged children, and its looking to be a perfect fit for Clark. I can't wait to see how his character materializes, as he decides to join Ward and it seems Ward has very specific plans for him. I can't wait to see what happens next. Based upon what we learned this week, and what we learned this week, this is turning into a big season and I can't wait to see what happens next. What did the rest of you think?